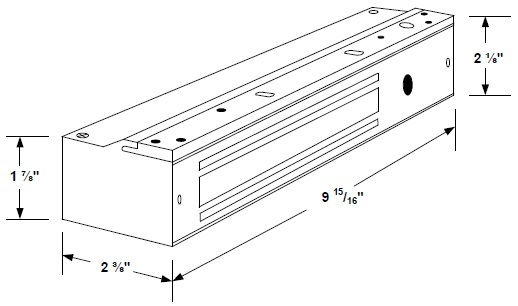 - Delivery: The SDC 1581SNDV Delayed Egress Magnetic Lock is in stock and available to ship. When unauthorized egress is initiated, the Mini Exit Check® delays egress through the door for a period of 15 seconds. Meanwhile, the person exiting must wait allowing personnel or security respond. The door unlocks after the 15 second delay period has elapsed, permitting egress. A signal from the fire/life safety system will release the lock immediately for uninhibited egress in an emergency. - Restricting the egress of patients for their own safety. - Restricting the egress of commercial center patrons for minimum security application needs. Size Matters. The Mini Exit Check is designed to meet the needs of long term care and commercial facilities that require a smaller, less obtrusive, and less expensive delayed egress lock that is better suited for minimum security needs. In addition, the subdued alarm tone is less disruptive to patients and staff. SDC has also maintained all the features and status outputs found in most higher holding force delayed egress locks on the market. - UBC, NFPA 101, NFPA 1, UFC, IBC, IFC and California Building Code Compliant. - 15 second exit delay, 2 second nuisance delay. - Station contorl required for lock reset following unauthorized egress. - Field selectable automatic or manual power-up after power outage and fire emergency release. Manual power-up is a UBC and California State requirement. - Small & Compact Size. - 15 Second Exit Delay when activated. - 1 Second Nuisance Delay. - Subdued Alarm with 2 Distinct Tones. - Door Release - Continuous. - Instant Reset from Bypass mode for interfacing with Patient Monitoring Systems. - Vandal resistant Proximity Sensor Trigger. - Auto Sensing 12/24VDC input power. - 5 foot Power Cable. Auto Power-Up - Occurs when power is restored and/or the fire panel is restored (Not available on California Versions). Manual Power-Up - This is a UBC & California Building Code Complaint Feature - Only after power restoration and fire panel reset may the lock be reset manually at the opening. A power-up key switch or keypad is required adjacent to the door.